Zen Tropical Beachfront Studio. Close to Log Cabins, Pipeline, Shark's Cove. This beachfront studio is on beautiful Ke Iki Beach. Enjoy sunsets and the crystal blue ocean just 30 steps from your door. Literally walk from your door, through the garden to the beach. A tropical garden view with lush green lawns surround the property. NEW VERY Quiet Split Unit Air Conditioner. 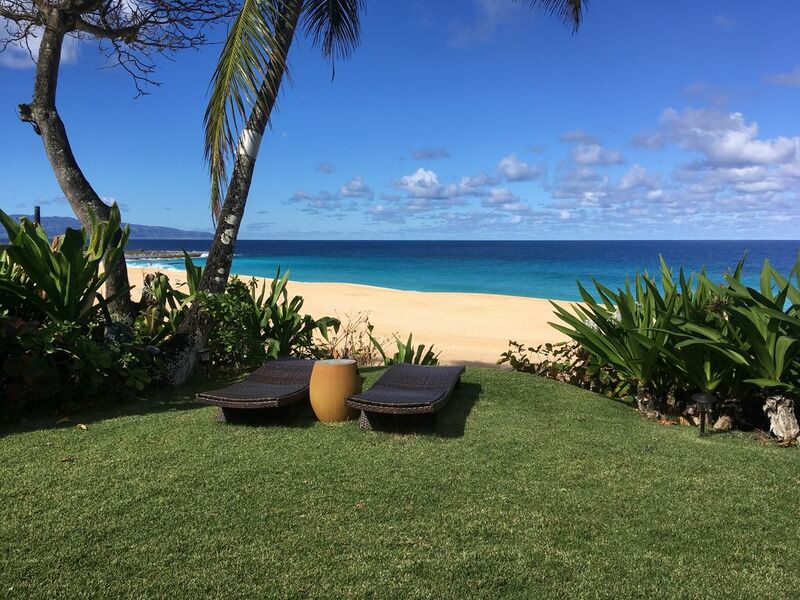 Whether watching the humpback whales breaching, Hawaiian spinner dolphins frolicking, swimming with the sea turtles, or napping/reading on the lounge chairs on the bluff overlooking the ocean and beach, this Hawaiian getaway will be unforgettable. All the furnishings and linens are kept very clean for your comfort. Newish Queen bed, dining area, WiFi, new flat screen TV, DVD and kitchenette with new 10.7 cubic ft. refrigerator, microwave, toaster, 2 burner hot plate, and coffee maker. Blow dryer, charcoal BBQ, soft cooler with blue ice, 2 bikes, 2 beach towels, 2 beach chairs and umbrella are provided. The studio is attached to our house which we live in year round. You have your own entrance. There is no one above or below you and the only common wall is the bathroom and closet. The studio has a garden view not an ocean view. I am very allergic to animals so no animals are ever permitted in the unit. Use the 2 bikes w/lock to cruise along the 5 mile long bike path to famous Waimea Bay 3/4 mile away, Sharks Cove 1/3 mile away, Pipeline Beach 1 mile away, Sunset Beach 2 miles away. This is not a hotel where daily cleaning is available. Clean linens will be given every 5-7 days depending on the agreement at time of booking. Laundry Mart is in Waialua Town 20 minute drive from our property and a 5 minute drive from Haleiwa Town. For a list of the various activities in the area go to Turtle Bay Resort website. NO SMOKING. NO PETS. NO PARTYING. 1/2 mile to market and food trucks. 15 minute drive to Haleiwa Town and Turtle Bay Resort with restaurants and shopping. Parking available on the street in front of our property. refrigerator/freezer, toaster, microwave, 2 burner hot plate, coffee maker. Water purifier. 2 bikes, beach chairs, beach umbrella, BBQ, wooden table to dine on the beach or in garden. Great location and experience! Close to foodland and Haleiwa. Close access to ocean and beaches on north shore. Studio was great and roomy. No access to washer and dryer tho so would be great to have more beach towels and bathing/hand towels available. Would definitely stay again! The studio was comfortable with everything you needed and exactly as pictured. The view from the yard was amazing and those lounge chairs were all ours to enjoy, you can sit there for hours looking out at the beach, ocean and beyond, absolutely amazing!! Beach towels/chairs/umbrellas, bikes and BBQ were provided which was great and the outdoor shower a must!! Great location, close to Sharkes Cove (great snorkelling and food trucks) Pipeline and Sunset Beach and close to the grocery store Foodland. Christina was lovely and helpful. Would definitely recommend! Beautiful location, the ocean is visible from the back yard. Inside is compact with kitchen hot plate, plenty of kitchen utensils. Bed is comfortable. 2 windows but no view. Ceiling fan works well, had difficulty figuring out how to work the TV. Lounge chairs outside to watch the ocean and surfers. Easy beach access. This space was great. The room itself is small. But if you do it right, you won't be in there long. The beach/chairs you see are truly yours to be at. Christina was great. Dropping in and giving recommendations and also letting us know we could ask her anything. Which we did and she graciously accommodated. Seriously though, location location. You can walk to a handful of great food trucks and the local Hawaiian grocery store--Foodlan-- which has been voted best poke... You can walk/run/bike ride to Ted's or Banzai Bowl (which you should). The beach spot is beautiful. It is simplistic, it is not 5 star resort but it has what you need. Do it, you won't regret it. Owners were very friendly and helpful. Incredible location, in an iconic setting. It was our first time to Hawaii and we are so glad we chose to spend a few days on the North Shore. The studio had everything you needed and it’s location could not be beat! The room was small but comfortable. The bathroom was clean. We enjoyed the coffee pot each morning. The location - wow! Steps from the beach with a beautiful view. The bikes and beach chairs made getting around easy. There was no one on the beach in front of the house so you almost had your own private beach. For a couple looking to be in a place that feels more authentic and not so touristy for a few days I would highly recommend. So glad you enjoyed our quiet hidden jewel. Hawaii Tax ID NO. GE-127-049-1136-01 christinadeweese@gmail.com.